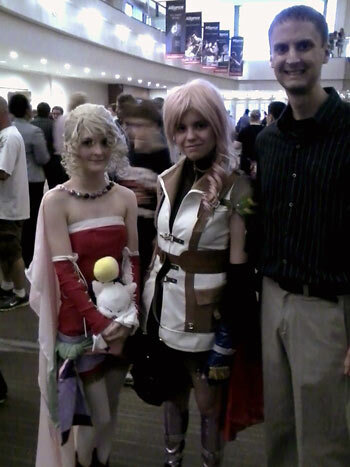 Dennis, at the Final Fantasy Distant Worlds concert, where he met Terra (FFVI) and Lightning (FFXIII), perhaps his two favorite FF characters! Who is this guy, and how is he qualified to teach a class about video games? I hail from the Great State of North Dakota, and played my first video game when I was six or seven, over 20 years ago. My parents knew some kids that were selling their NES, so my brother and I pooled our money and bought the system without having ever played a game before ($50, or $25 a piece, which was a lot of money for a kid!). Super Mario Bros. and Duck Hunt were our first games, though we were terrible at first. After much practice, trial and error, determination, and a few helpful teaching sessions from some well-informed babysitters, we gradually got better. I received my undergraduate degree in journalism from North Dakota State University, followed by a master's in health communication from NDSU. I recently completed my Ph.D. in mass communication from the University of Florida. My primary research interest is people with chronic illness and how they communicate about their illness using new media. So what does health communication have to do with video games? While I haven't conducted my own research projects on the topic, I've followed with interest research on the health effects of video games: fitness and obesity, violence and aggression, addiction, and sexuality and body image. I've also been watching for years, with dismay, how the news media often covers video games. I created this class for three reasons: 1) so a new generation of gamers can learn more about this medium's past, 2) so students can be informed about all current issues surrounding video games, and hopefully contribute something more to society's discussions than just hype and hyperbole, and 3) so students can think critically about the games they play, and how these games are situated within our cultrual context. Computer: Half-Life; Interstate '76; Minecraft; Portal 1 and 2; Roller Coaster Tycoon; StarCraft; Star Wars Jedi Knight: Dark Forces II; Warcraft 2. Game Boy/Advance: Advance Wars; Final Fantasy Legend 1, 2, and 3; The Legend of Zelda: Link's Awakening Pokémon Red and Blue; Tetris. GameCube: Animal Crossing; Eternal Darkness: Sanity's Requiem; Fire Emblem: Path of Radiance; The Legend of Zelda: Wind Waker and Twilight Princess; Metroid Prime 1 and 2; Super Smash Bros. Melee; Timesplitters 2; Tony Hawk's Pro Skater 3. NES: Contra; Double Dragon; The Legend of Zelda; Spy Hunter; Super Mario Bros. 1, 2, and 3. N64: Banjo-Kazooie; Diddy Kong Racing; GoldenEye 007; The Legend of Zelda: Ocarina of Time; Mario Kart 64; Star Fox 64; Top Gear Rally. PlayStation 2: Dance Dance Revolution Max, Max 2, and Extreme; Final Fantasy X; Kingdom Hearts 1 and 2; Timesplitters: Future Perfect. SNES: Chrono Trigger; Donkey Kong Country 1, 2, and 3; Final Fantasy III (FFVI); The Legend of Zelda: A Link to the Past; Paperboy 2; Sim City; Super Mario World 1 and 2; Tetris Attack; Zombies Ate My Neighbors. Wii: Donkey Kong Country Returns; Kirby's Epic Yarn, The Legend of Zelda: Skyward Sword; Metroid Prime 3; New Super Mario Bros. Wii; Super Mario Galaxy 1 and 2; Super Smash Bros. Brawl. Xbox 360: Final Fantasy XIII; The Walking Dead; Tomb Raider (2013).